My book club unanimously adored Water for Elephants (which doesn’t happen that often! ), and that was fiction; this book is more of an autobiography, chalk full of facts about these incredible, intelligent creatures. 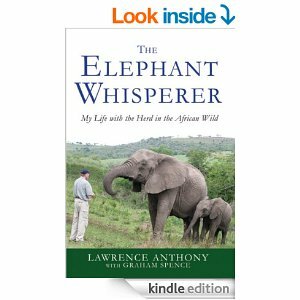 After much time, several trials, and patience on the part of Lawrence, this group of wild elephants lets this man into its community. He discovers that the low rumbles of their stomachs is a form of communication that passes messages through the herd and beyond to other herds. The matriarch trusts him so much that he gets to experience an “introduction” to the newest baby members of the herd.